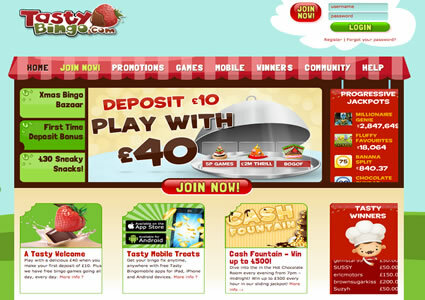 Tasty Bingo finally opened its virtual doors on 4th March 2010 after much speculation as to what the site may or may not offer internet bingo players. A tasty welcome awaits when you land on the homepage, least of all from their bingo logo – a chocolate covered strawberry. This brand is on the Joy of Bingo Network, along with sister sites like Wink Bingo and Posh Bingo, so you could be forgiven for thinking this site is going to be same old, same old. Let us assure you, although offering the same game play as the other brands, this is a whole new ball game in the world of internet bingo! Tasty Bingo has removed the need to enter your financial details when registering a new account; this means new players don’t need to worry, simply enter the industry-standard details and you can get straight into playing a few games of free bingo that are on offer! Without a deposit of between Â£5 and Â£100 or earning any truffles at Tasty Bingo you only have access to one of their free bingo rooms, but that’s all you need to get you started. Becoming a new player with Tasty Bingo means you’ll have the opportunity to take advantage of their welcome offers and first deposit specials. These are subject to change so always check out what you’re claiming before you make a deposit. Another little something different is the layout of the bingo lobby. Standard to the 888/Globalcom sites is the bingo tabs across the screen whereas at this site your choice of rooms is to the left and the actual rooms in the centre of your screen. Players have the choice of Freebie rooms, 5p, or 10p bingo rooms and also pre-buys, instants and progressives. Each section boasts its own array of bingo rooms offering both 75 and 90 ball bingo games. Tasty Bingo will definitely be whetting the appetite of bingo players across the country and is bound to enjoy the popularity of other big names in the world of online bingo! Not to mention you can make some extra cheeky bets alongside playing bingo. Never heard of it? We hadn’t either, until crossing paths with this original feature. Basically you will be able to place a bet on an event that takes place during the proceedings of a bingo game; minimum stake is 20p and maximum is Â£1. Place these bets on either of the following – ‘Bet the Balls’ or ‘Win the Race’. Currently ‘Side Bets; can only be placed in the Tangy Tomatoes and Cheers bingo rooms. One particular feature that had become popular with players at Tasty Bingo are the Joy of Bingo networked games. 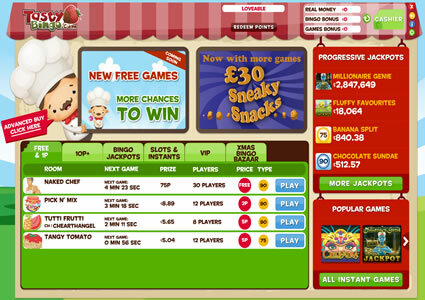 These are promotional games that run over any of the sites belonging to the same network which include Wink Bingo, Posh Bingo, Red Bus Bingo and of course Tasty Bingo. Quite often you have the chance to earn free bingo cards for these games and always with the chance to win some big guaranteed jackpots. Keep your eyes on the promotional pages for the next scheduled game. Bingo gameplay can be changed at Tasty Bingo dependant on your preferences. 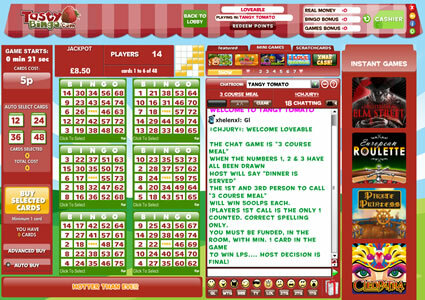 Some players like to leave the computer to mark their bingo tickets whilst others like to do the job themselves, the choice is yours. 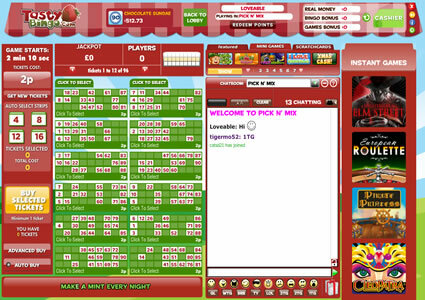 Additional customisation can be set by visiting the ‘Options’ tabs above the bingo chat rooms. You can now play ‘take away’ bingo with the new tasty mobile app. Bingo on the go is to available on smartphone, iPad users. There are two ways to install their app, simply search for Tasty Bingo via your mobile device or head over to the mobile section on their site and scan the QR code. Along with bingo games you will find some great slots on offer which are exclusive to mobile app users only. Naked Chef is the name of the free bingo room at Tasty, here you can play for free bingo jackpots ranging between 50p and £1. This room is open to all players, funded or not and all wins are credited to your account as bonus funds. This means that whilst you cannot withdraw bonus funds, you can use them to purchase bingo cards in their real play rooms. Look out for the banana pattern in the 75 ball bingo rooms, bingo on this in 28 numbers or less to win the progressive Banana Split jackpot. Win a full house in the 90 ball bingo room in 39 bingo calls or less and you will be taking the Choc Sundae jackpot prize to your bingo bank! Tasty Bingo boasts a whole plethora of bingo side games at their site. From progressive jackpots through to Blackjack, instant wins and much more besides are available for all players who like a little side dish with their bingo.